Jason Tinsley is a Banker and Managing Director for J.P. Morgan Private Bank in Birmingham, Michigan. In this capacity, he delivers sophisticated Investment Management, Estate Planning, Trust, and Banking solutions to high net worth clients. Prior to joining Private Banking, Jason served as a District Manager managing the sales and operations for Chase branches across southeastern Michigan. He also served as an Institutional Client Advisor for J.P. Morgan in the Foundations and Endowments Group and has experience in the brokerage business. Jason has served on boards of several community organizations. 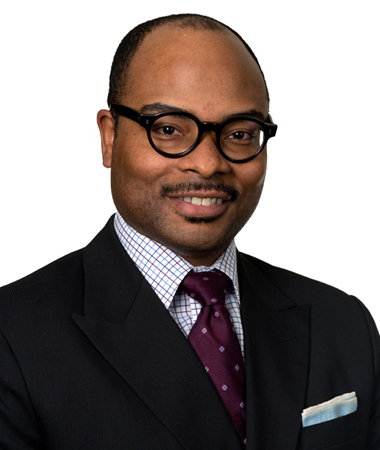 His past positions include president of Detroit PAL, member of the Founders Junior Council for the Detroit Institute of Arts and past President of the Urban Financial Services Coalition – Detroit Chapter. He is a Global Chair Emeritus for the J.P. Morgan Chase business resource group B.O.L.D. ; currently Board Chair of the Detroit Urban League and Board Member for Beaumont Healthcare Foundation and the Detroit Jazz Festival Foundation. Jason has a Bachelor of Science from Central Michigan University. Jason is active in the community and he resides in Grosse Pointe Park with his wife Tina and 3 sons. He enjoys reading, running, and golf.